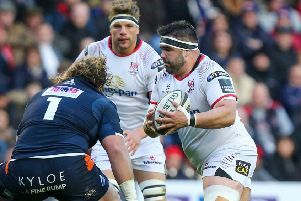 Ulster Rugby CEO Shane Logan has appealed for supporters to come out on Saturday night and get behind the Provincial side’s players in what is a make or break match in the Guinness PRO14. The fallout from the weekend decision to axe Paddy Jackson and Stuart Olding from Ulster and Ireland has led to season ticket holders and other supporters threatening not to attend Saturday’s game as a protest against the decision. Ulster are due to face Glasgow Warriors in their last home game of the regular PRO14 league season - their penultimate game of the campaign. They must win the game if they are to keep their slim chances of making the play-off final series or at least ensuring a May 5 home play-off for a European Champions Cup spot next season. The atmosphere during last Friday night’s 8-0 win over Ospreys - Ulster’s second win on the bounce - had reached a level rarely experienced this season after what has been a difficult campaign for the club. But in light of the IRFU decision at the weekend to revoke the contracts of Jackson and Olding some of the most ardent of supporters are contemplating not going to this week’s game, but also not renewing their season tickets. The high-profile court case which ran for nine weeks at Belfast Crown Court brought to light a number of sexually explicit and offensive text exchanges and it is because of those the players have found themselves exiled by Ireland and Ulster. But there are also season ticket holders who had claimed before the outcome of the review who said they would not renew their tickets or attend a game if the players were reinstated. On Monday Logan said he could understand the strength of feeling that was out there. “I understand how difficult it is, how angry they (fans) feel and had the decision been made the other way I have no doubt a significant amount would have taken the contrary view. “So what we have to do is to respect people’s strongly held views, but I would urge us all to get behind the team, get behind rugby in Ulster and take us to where we want to be. The Ulster supremo added that the morale in the team, which has been struggling this season, had also taken a battering. However he insisted his position at the top was not under threat. He said: “My role isn’t in question. My role here, in very traumatic circumstances, is to do at least two things. “One, is to ensure that the existing reinforcement programmes that players receive and people across rugby receive are as effective as possible. “The second thing we have to do is try and recognise that people have very different points of view and to try to find positive territory, a unified approach to move forward. “We are going to put the decision behind us and move on. There is no question that all of us have been significantly affected by the charges and the staff. “I think the players and the staff and wider rugby has done well to do as well as they have done in very difficult circumstances. Ulster play Glasgow on Saturday night (kick-off 6:05pm).